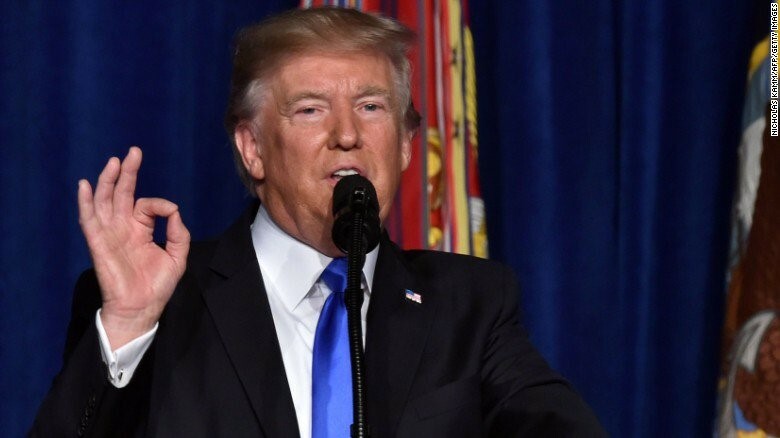 When he stepped before the cameras last night to deliver his first prime time address to the nation, Donald Trump became the third president to reluctantly take ownership of the war in Afghanistan. After campaigning on ending costly entanglements for a war-weary country, the president admitted he was hemmed in by some hard realities. Though Trump declined to provide specific numbers, the new Afghan strategy he unveiled last night includes roughly 4,000 additional U.S. reinforcements to the 8,400 presently deployed. U.S. officials say the new strategy will involve: helping improve the Afghan government’s ability to support and regenerate Afghan Security Forces who suffered 6,700 casualties just in the past year; relaxing the rules of engagement for U.S. airpower; rejecting deadlines for the withdrawal of U.S. troops, instead using “conditions on the ground” as the primary metric of success; persuading NATO allies to increase their own troop levels in Afghanistan; and putting significant new pressure on Islamabad to target the Taliban and allied extremist groups operating in Pakistan. Few national security experts are optimistic the Trump Administration can fundamentally change Pakistan’s tolerance for extremist groups. Given the weakness of the government in Islamabad, which maintains a nuclear weapons arsenal in a country rife with jihadist groups, there is only so much pressure U.S. administrations have felt comfortable applying. And without a fundamental change in Pakistan’s strategic calculations, the “victory” Trump promised the nation last night will prove elusive, experts say. For a president whose distaste for “nation building” and foreign entanglements is palpable, the decision to surge troops to Afghanistan and take ownership of the war was one of the most difficult of his young presidency. The American public largely perceives the Afghan war not only as the nation’s longest, but also one of its least satisfying. In a 2015 ABC News/Washington Post public opinion poll, for instance, 66 percent of respondents said considering its costs to the United States versus benefits, the Afghan war was not worth fighting. And yet the generals that Trump has surrounded himself with tend to see not one long war, but a conflict in distinct phases, during which the fortunes of the Taliban and allied extremist groups have waxed and waned depending on the level of U.S. engagement. First came the immediate post-9/11 phase in 2001-2002, when the Taliban were toppled and remnants of Al Qaeda were sent retreating into Pakistan, followed by years in which Afghanistan was largely pacified. Then the Pentagon shifted its focus and forces with the 2003 invasion of Iraq, however, and became mired in that conflict for years. By 2008-9 the Taliban had recaptured large swaths of territory in eastern and southern Afghanistan. The Obama “surge” of 2009-2012 culminated in the deployment of nearly 100,000 U.S. troops, who took back that lost ground and helped build an Afghan Security Force of roughly 340,000 troops and national police. President Obama set a 2014 deadline for handing the war off to Afghan Security Forces, and had hoped to have all U.S. troops out of Afghanistan by 2016. Those plans were put on hold after major Taliban gains. Today the Islamist insurgents again control or contest an estimated 40 percent of Afghanistan. “I think it’s hugely important to remember why we went to Afghanistan in the first place, and why we have stayed: to ensure that Afghanistan is not once again a sanctuary for Al Qaeda, the way it was when Al Qaeda planned and conducted the initial training for the 9/11 attacks,” retired Gen. David Petraeus, who commanded the U.S. troop surges in both Iraq and Afghanistan, writes in an email. The Trump administration’s new Afghan strategy represents an important victory for Lt. Gen. H.R. McMaster, Trump’s national security adviser and the strongest proponent within the administration for a mini-surge of U.S. “train and assist” troops to break a stalemate and roll back recent Taliban gains. McMaster had been engaged in an increasingly bitter and public tug-of-war over Afghan policy with recently-fired White House chief strategist Stephen Bannon, who wanted Trump to pull U.S. troops out of Afghanistan. McMaster sold the new strategy to Trump as a correction to failed Obama administration policies. Even before joining the administration, for instance, he publicly criticized the Obama administration for setting artificial deadlines for troop withdrawals on the faulty assumption that “war will end if we just disengage from it,” as McMaster put it in one speech. Like many officers in the senior military ranks, McMaster believes that Obama’s premature withdrawal of U.S. troops from Iraq in 2011, and the subsequent rise of the Islamic State there, offered an abject lesson in how not to end a war. White House Chief of Staff John Kelly, a retired Marine general, is known to share that view.